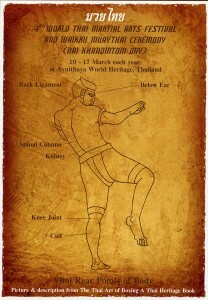 In Thailand, March 17 is the day when those involved in Thai boxing (Muay Thai) celebrate a hero of the sport. Boxer’s Day isn’t a public holiday, but there are commemorative events at various Muay Thai stadiums and training camps and it is a day with particular significance for the town of Ayutthaya, the home of the legendary figure of Nai Khanom Tom. In the 1760s the Burmese captured the ancient Thai capital of Ayutthaya (in those days Thailand was called Siam). Many of Ayutthaya’s inhabitants were taken as prisoners back to Burma. Amongst those captured were a number of boxers including a man known as Nai Khanom Tom. According to the legend, the Burmese king, Mangra, organised a religious festival with many events and various forms of entertainment. King Mangra wanted to see how the Siamese style of boxing compared to that of the Burmese. Nai Khanom Tom was the man selected to represent Siam against a Burmese champion fighter. Nai Khanom Tom performed the traditional wai khru ritual before the bout and when the fight began he launched an unstoppable barrage of punches, kicks and elbows that crushed his Burmese opponent. However, the referee said the knock-out was invalid claiming the Burmese man had been distracted by the strange wai khru dance. The Burmese king asked Nai Khanom Tom if he would prove himself again. The Siamese fighter agreed and according to the story, Nai Khanom Tom defeated 9 Burmese boxing champions one after another and without any rest interval between fights. King Mangra was so impressed with what he had seen that he awarded the Siamese man his freedom (in some historical versions of the story the other Siamese prisoners were also released). King Mangra gave the Siamese boxer the choice of great wealth or two beautiful wives. Apparently, Nai Khanom Tom said wealth was easier to come by and so chose the two Burmese women instead before returning back to Siam. National Muay Thai Day is a big event in Ayutthaya and the town organises a week-long annual festival culminating on March 17. Displays of Thai boxing and martial arts attract participants from around the world. A statue of Nai Khanom Tom stands in Ayutthaya (at the provincial sports ground) and Thai boxers and ordinary townsfolk will pay respects to the home-town hero by draping his statue with garlands of flowers.